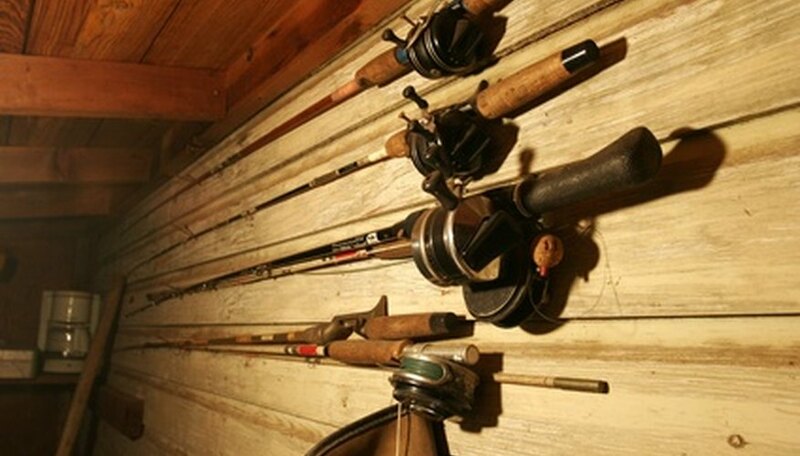 When it comes to protecting your fishing rods, nothing is too extreme. However, something made from steel can is heavy and hard to carry around, especially if you need more than one tube. PVC pipe is a good choice, as long as it is schedule 40 due to its thick walls, making it difficult to break and light to carry. In addition, a 4-inch schedule 40 PVC pipe can hold as many as eight rods. Only a few tools are required, and DIY anglers should be able accomplish this project. Determine the tube length. Measure the length of your longest fishing rod and add 6 inches. Mark the schedule 40 PVC pipe at the desired length. Wrap the pipe with masking tape so one edge of the tape is on the mark. Cut the pipe. Trace a line along the edge of the masking tape with a pencil. Remove the tape and place the schedule 40 PVC pipe in a bench vise so that the line is close to one side of the vise. Cut the pipe with a hacksaw until the frame of the hacksaw hits the pipe. Rotate the pipe in the vise and finish the cut. Remove the burrs. Keep the pipe in the vise. Sand the cut edge with 100-grit sandpaper to remove the burrs caused by the hacksaw blade. Rotate the pipe if needed, but leave it in the vise. Glue a 4-inch cap on one end of the pipe. Apply PVC primer to the end of the pipe and the inside of the 4-inch cap. This cleans the area to be glued and softens the PVC for bonding. Apply the PVC glue immediately after the primer, push the cap in place and twist it 1/4 turn to ensure the bond. Create the lockable end of the tube. Remove the pipe from the vise, put the opposite end of the pipe in the vise and tighten it down. Apply PVC primer to the inside of the threaded clean-out fitting and to the end of the pipe. Apply the PVC glue immediately after the primer and push the clean-out fitting onto the pipe. Twist the fitting 1/4 turn for the best bond. Make the lockable end of the tube. Screw the clean-out plug into the clean-out fitting. Drill a 3/8-inch hole through the clean out fitting and the removable plug. Slip the carriage bolt into the hole to check its fit. Remove the pipe from the vise and put the carriage bolt in the vise. Drill a 5/32-inch hole through the end of the carriage bolt for the lock. Sand the outside of the tube and paint it with lacquer-based paint if desired. Slip a hose clamp through a key ring and attach the clamp to the tube to hook a carrying strap to it. Do not leave the hacksaw or PVC chemicals within the reach of small children. Do not apply lacquer-based paint without proper ventilation.